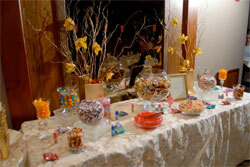 Candy Buffets have become a hot trend whether you are providing the service as your favor or just an added bonus to your guests, it is sure to be the hit of the party! At Couture the Candy Buffet is provided as a full service, your buffet will be attended all evening to assure everything remains stocked. As daytime turns to night your Buffet will become alive!